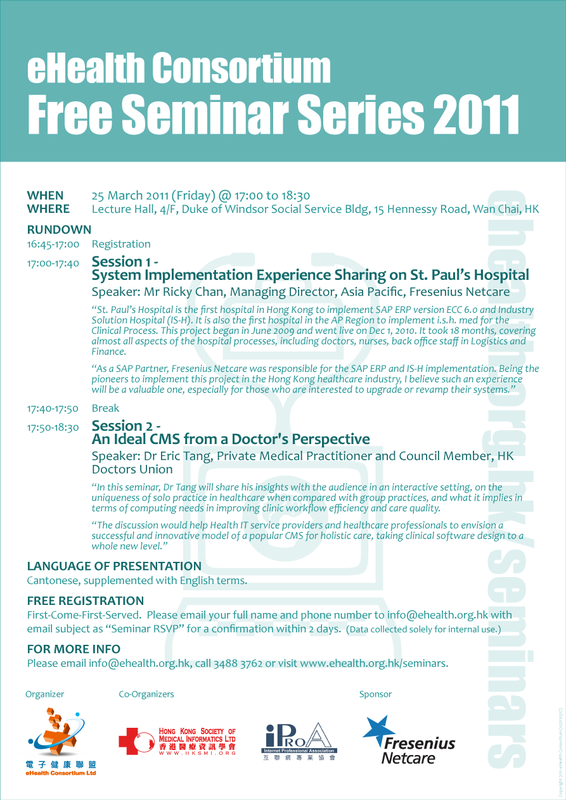 eHealth Consortium is pleased to announce a free quarterly seminar series in 2011 for members, with the aims to boost the awareness of ehealth adoption for improved care delivery. Limited seats available, REGISTER NOW! "St. Paul's Hospital is the first hospital in Hong Kong to implement SAP ERP version ECC 6.0 and Industry Solution Hospital (IS-H). It is also the first hospital in the AP Region to implement i.s.h. med for the Clinical Process. This project began in June 2009 and went live on Dec 1, 2010. It took 18 months, covering almost all aspects of the hospital processes, including doctors, nurses, back office staff in Logistics and Finance. "As a SAP Partner, Fresenius Netcare was responsible for the SAP ERP and IS-H implementation. Being the pioneers to implement this project in the Hong Kong healthcare industry, I believe such an experience will be a valuable one, especially for those who are interested to upgrade or revamp their systems." "In this seminar, Dr Tang will share his insights with the audience in an interactive setting, on the uniqueness of solo practice in healthcare when compared with group practices, and what it implies in terms of computing needs in improving clinic workflow efficiency and care quality. "The discussion would help Health IT service providers and healthcare professionals to envision a successful and innovative model of a popular CMS for holistic care, taking clinical software design to a whole new level." Cantonese, supplemented with English terms. Presentation materials in English.